Are you a September Princess? If you are lucky enough to celebrate your birthday during the month of September then this is the badge for you. Its a sweet navy blue colour with white polka dots & the text September Princess in blue bubble font. Oh & not forgetting the golden crown. 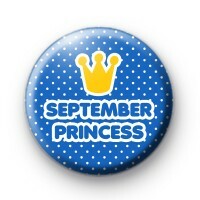 Wear this badge throughout the whole month of September so people know its your Birthday.